Geddy Lee isn't a big fan of social media. "I sometimes look on Twitter to follow baseball transactions," he says. "But that's it. I'm also not on Facebook or anything. I see it as an addiction and I have enough addictions. God knows I pick up my phone enough to check baseball scores." As a baseball fan without a smart phone, I am in no rush to judge. I don't need more addictions, either. The recently-concluded winter baseball meetings likely kept Lee as busy following transactions as they kept me, with several big trades and free agent signings. My Reds and Tigers both made moves that affect expectations for 2015. Pitchers and catchers report in a little over two months. Lee and I will be checking scores again soon enough. For a while now I've been intending to take more photographs, both for practice and for use on my blog. 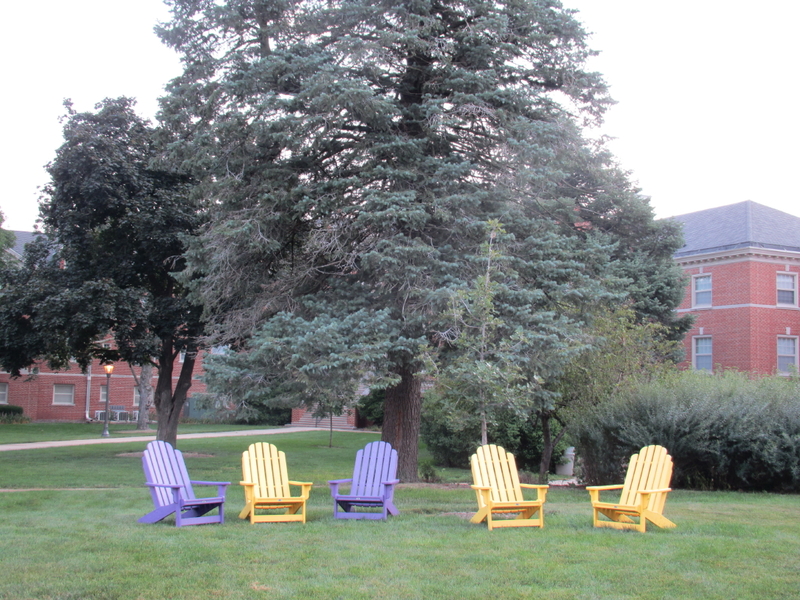 Some new furniture in the university quad prompted me to snap a few this morning. Here is one; click through for high-res. PHOTO. Gathering Place, by Eugene Wallingford, 2013. This work is licensed under a Creative Commons Attribution 3.0 Unported license.